Discussion in 'UFC Discussion' started by ALAN PARTRIDGE, May 15, 2014. 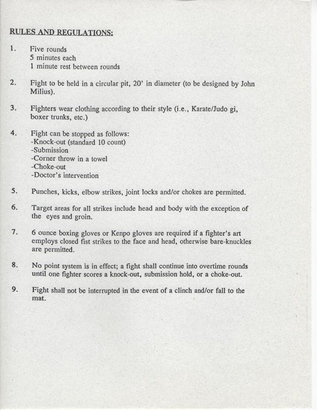 Co-founder of Ultimate Fighting Championship (UFC), Campbell McLaren, took to Twitter (via Fox Sports ) to post the official rules list for the first-ever event, which took place on Nov. 12, 1993 in Denver, Colorado. Interestingly enough, rule No. 1 is actually still in place today for championship fights. Thankfully, the rest of the rules and regulations have been updated over the last 20 years. Rule # 8 would've been nice to have to this day. If I recall correctly, the only two rules were no eye gouging and no fishhooking. You're not confused. you just happen to believe everything you've been told. UFC 1 most certainly had rounds. all of the fights ended in under 5 minutes. in ufc 2 they removed the rounds. huh. guess i'll have to watch it again. I thought it was common knowledge that the whole "THERE ARE NO RULES" was blatant rhetoric, when there were in fact a ton of rules -- including rounds. they had a standard 10 count ko! Interesting. John Milius? Somehow this fact had eluded me. No. No, it would not. Does "original rules" mean the VERY FIRST set of rules drawn up for the event, which were later altered before the event was held, or that these were the rules actually in place for the first event? John Milius is perhaps the weirdest guy ever. Him and Arnold doing commentary on Conan the Barbarian is absolutely hillarious. Mostly unintentionally. There is a documentary on him on Netflix which I've been meaning to watch. Maybe now's the time? These may have been proposed rules but certainly they were not all in effect. For instance the Octagon was used and featured in UFC one. There was no mention in the video of rounds or a time limit of any sort so I don't think that was in effect. Most fighters don't have cardio to go 3 rounds, very few can last 5. I'd rather not watch 2 very gassed fighters continue to try to end the fight. Yeah they removed the rounds cause they thought there was no point having them since all the fights were finishing early. Once people learnt sub defence that changed obviously.